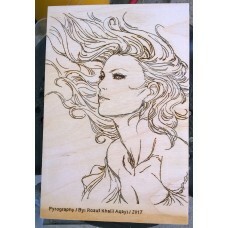 Pyrography is the art or technique of decorating wood or leather by burning a design on the surface with a heated metallic point. A large range of tones and shades can be achieved. Varying the type of tip used, the temperature, or the way the iron is applied to the material all create different effects. 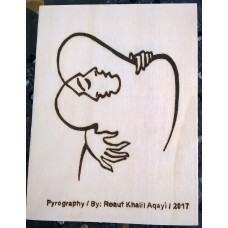 After the design is burned in, wooden objects are often coloured. Light-coloured hardwoods such as sycamore, basswood, beech and birch are most commonly used, as their fine grain is not obtrusive. 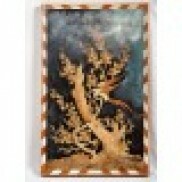 However, other woods, such as maple, pine or oak, are also used. 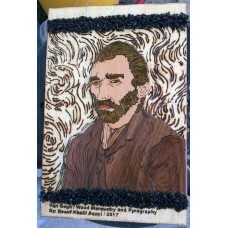 Pyrography is also applied to leather items, using the same hot-iron technique. Leather lends itself to bold designs, and also allows very subtle shading to be achieved. 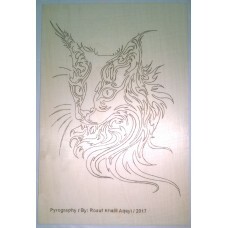 Specialist vegetable-tanned leather must be used for pyrography (as modern tanning methods leave chemicals in the leather which are toxic when burned), typically in light colours for good contrast. 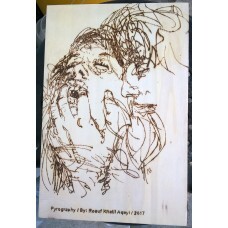 Pyrography is also popular among gourd crafters and artists, where designs are burned onto the exterior of a dried hard-shell gourd. 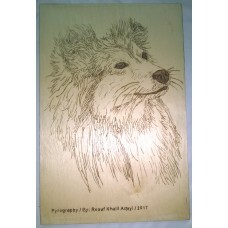 --------------------------Art type: Pyrography / Pyrography is the art or techn..